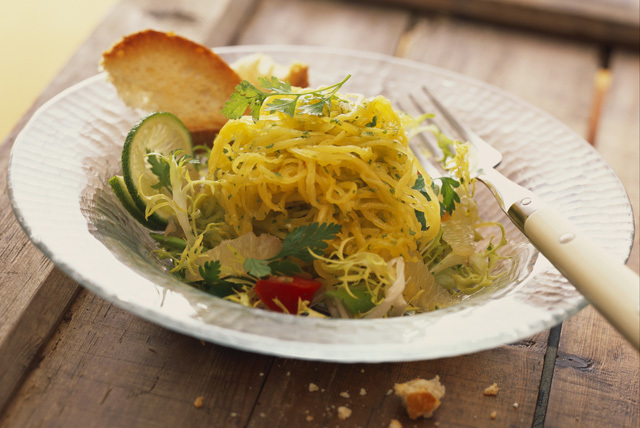 A simple, quick and delish way to serve spaghetti squash is to use it to make this satisfying salad. The Italian dressing and Parmesan cheese team up to add the perfect finishing touch to this tasty five-ingredient recipe. Spray cut sides of squash with cooking spray; place, cut sides down, on baking sheet. Bake 30 to 35 min. or until tender. Cool 10 min. Use fork to scrape squash flesh into spaghetti-like strands. Toss salad greens with peppers and squash; drizzle with dressing. Sprinkle with cheese. Place squash halves, cut sides down, in microwaveable dish. Add enough water to dish to fill to 1-inch depth. Microwave on HIGH 12 min. or until squash can easily be pierced with fork.